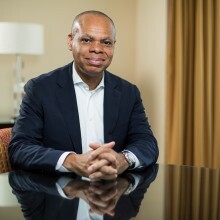 Patrick Gaspard is president of the Open Society Foundations. He joined the Foundations as vice president in 2017. Prior to joining Open Society, Gaspard served as the U.S. ambassador to South Africa from 2013 to 2016. Gaspard has extensive experience in presidential and congressional campaigns. Most recently, he served as a senior aide to President Barack Obama, as the executive director of the Democratic National Committee, and as an assistant to the president and director of the White House Office of Political Affairs. He was the national political director for Obama for America in 2008. He began his career as a union organizer in New York City. Gaspard was the executive vice president and political director for the Service Employees International Union. He also served as a senior aide to former New York City Mayor David Dinkins, the Manhattan borough president, and on the New York City Council. Gaspard attended Columbia University in New York City.